As hoped, Warner Bros. released a brand new Comic-Con trailer for Fantastic Beasts: The Crimes of Grindelwald, a film that has a ton of questions surrounding it. 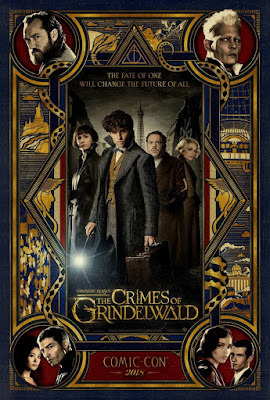 The sequel stars Jude Law as a young Professor Dumbledore, who asks his former student Newt Scamander (the returning Eddie Redmayne) to help him track the evil Grindelwald (Johnny Depp) before he can recruit an army to start a war throughout the magic and non-magic worlds. Even with this trailer there remains questions about Depp, who has been in the background for most of the early marketing. Law recently admitted that he doesn't share any scenes with Depp, which is odd but makes sense if Dumbledore and Grindelwald don't battle until a later movie. Also, the question of Dumbledore's sexuality won't be addressed at all, even though it's a component of his life that fans are very interested in. Directed by David Yates with a script by J.K. Rowling, Fantastic Beasts: The Crimes of Grindelwald opens November 16th.